Pet Rabbit Care: 9 pet care tips will give you confidence in your ability to care for your pet bunny rabbit and understand its needs. Care and feeding pet rabbits. Cages serve as protection from predators. All cages, hutches, runs or pens need to be sturdy and predator-proof. We don't like to remember this, but rabbits <i>are</i> at the bottom of the food chain, and your pet dogs and cats are still carnivores and predators by instinct. The North Dakota State University Agriculture Department suggests the following space allowances for caged rabbits. Most rabbit breeders tend to go a bit bigger than they recommend, to ensure the animal’s comfort. For pet rabbits that also get exercise outside their cages, these dimensions are probably close to perfect. It's remarkably easy to build your own rabbit cage. We'll show you how to complete every step of cage-making, and more. Or if you prefer, you can purchase ready-made cages for a little bit more money. Many pet stores, feed stores and rabbit manufacturing companies sell very nice cages for both indoor and outdoors. (DON’T get one with solid plastic sides...it gets too hot for the rabbit.) You can get cages complete with urine-guards, feeders and water crocks should you wish. Put a piece of 1/4 inch plywood on top of the cage. 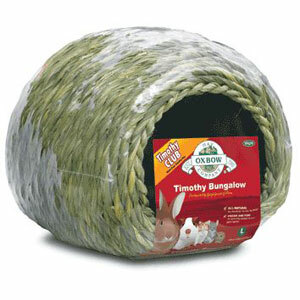 That helps the rabbit feel safer, because the cage will feel a little more like a burrow. 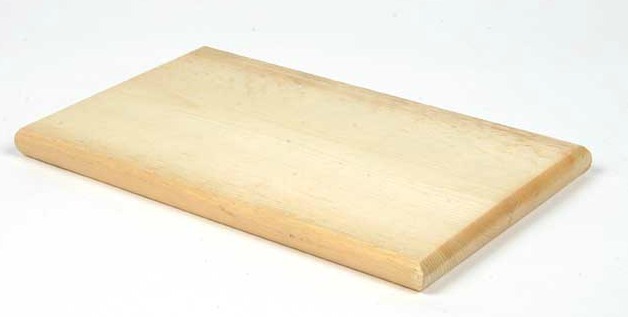 Resting Boards in all-wire cages: There are various sorts of resting boards you can purchase for the bunny's comfort, and still get the benefits of the wire floor, like cleanliness and ease of cleaning. Pet rabbits need a clean living area. For indoors, litter-box-train your pet rabbits, use wood-based bedding or litter, and clean it out at least once a week. What rabbit litter is best? Surprisingly, the best we have found, considering cost, effectiveness and safety, is the tried-and-true kiln-dried pine shavings. Get all our recommendations on rabbit beddings here. Understood, there’s not a pet rabbit alive that is completely stress-free all the time, but if it has a retreat (its cage) or a safe hiding spot to which it can flee when it feels afraid, its anxiety levels will remain very low most of the time. If you notice that your pet rabbit doesn't like being picked up, it is likely because a prey animal always fears for its life, at first. But with gentle care, slow movements and frequent handling, you can teach your bun through experience that you're not the big bad wolf. He'll lose most of his fear eventually, although probably not the actual timidity. You don't have to turn your house into a silent tomb for the sake of your bunny. Just ensure that your pet rabbit can 'escape' to safety when he gets stressed. For more information on pain vs. fear in the mind of a rabbit, see Taking Care of Pet Rabbits. Your little buns love to chew. But they can become shish-ka-bobs if they bite into an electrical cord. Pet rabbit care may include thinking like a rabbit as you evaluate each room in your home. Drop to the floor and look around. What would a rabbit do? Watch for toxic houseplants. Antique chair legs are chewable, as are the baseboards. Hmmm, better keep a close eye on your rabbit initially, until you know he'll be safe when loose in your house. You can feed commercial pellets from the local pet or feed store, or feed a small amount of pellets along with hay and fresh green forages. Please check the date on the bag and purchase feed that is fresher than two-and-a-half months old. Old feed loses enough nutrients through oxidation to seriously affect a rabbit's health. Your young growing bunny can be free-fed commercial pellets. 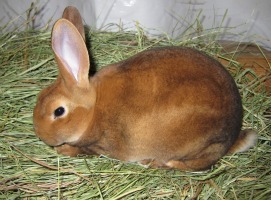 But at around 5 months old (or 4 months for smaller breeds), the bunny’s weight gain begins to level out. At this point, you can cut back on the feed and give him only what he will clean up within a few hours or so. This means many hours per day with an EMPTY food crock. Despite the empty food crock, the bunny will still eat cecotropes and whatever hay or straw you have provided. For pet rabbits, the very best rabbit feed we have found is milled by Sherwood Forest Rabbit Food. It is available through Amazon.com. A big pitfall is feeding your pet bunny rabbit TOO MUCH, especially as it becomes an adult. Turning it into a bowling ball is not good. Don’t fear the bunny will starve - the best thing you can do for your rabbit’s health and longevity is to not overfeed it. Weigh the rabbit at 5 ½ to 6 months of age, and use that weight as a baseline. Forever after, unless pregnant, you should aim to maintain your pet rabbit’s weight at this level. 1 ounce of pellets for every pound of rabbit, measured by weight, is the usual rule of thumb. If your rabbit weighs 6 pounds, you would expect that 6 ounces of pellets per day will keep the rabbit healthy and maintain its weight at an ideal level, understanding that activity levels and individual metabolisms may alter this amount just a little. Readjust the amount of your rabbit's feed and exercise levels depending on each weight. Also note its behavior. If it dives into its feed desperately like it hasn’t eaten for a week, give it a bit more. If there’s feed still left over at the next feeding, feed a little less. 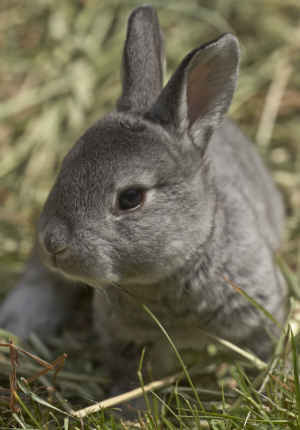 Do allow your rabbit to eat grass hay every day or frequently, as much as it wants. Hays such as orchard grass or timothy hay improve health and digestion, without the risk of obesity. See Feeding Rabbits for lots more information on feeding adult rabbits and adding green forages and veggies to the diet. 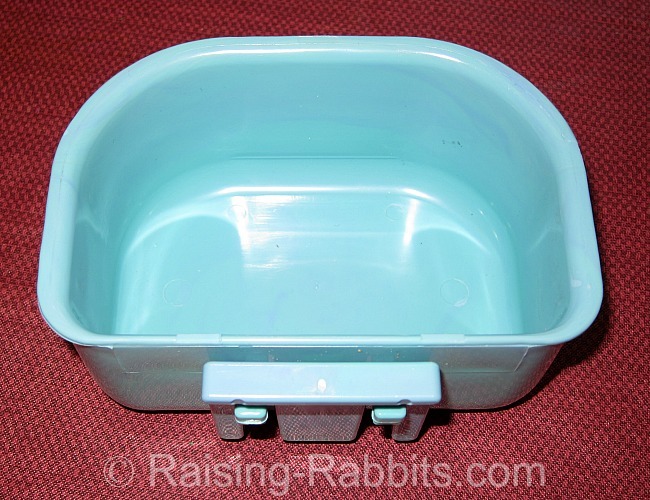 Purchase J-feeders, crocks, and waterers at our Raising-Rabbits Store. Ample water is essential to wellbeing, even to survival. Give them all the fresh water they can possibly drink, every day. If they get all they need, they'll be healthy and well-conditioned. Clean and disinfect both crocks and water bottles on a regular basis. If a rabbit stops eating, the first thing to check is the water. The water valve might be clogged, or the crock knocked over. Rabbits cannot eat if they cannot drink. If you choose a valved water bottle, the ones with lids at the top are really cool. Instead of unhooking the thing from the cage to fill it, you can open the lid and fill it from the top. But these still need to be cleaned on the inside now and again. A bottle brush works well. Pet stores are bursting with rabbit toys they'd love to sell you. Some are downright ingenious. 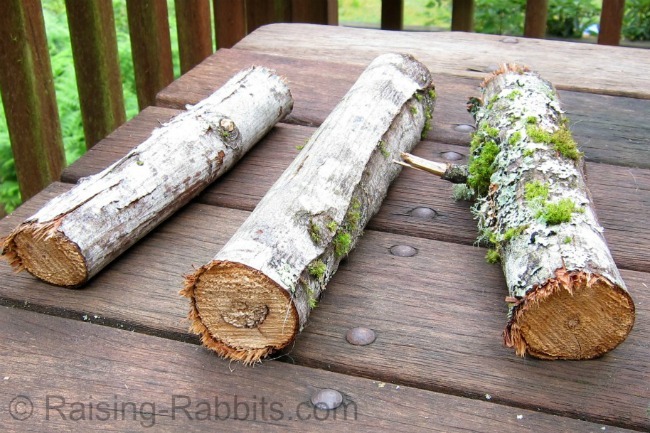 These branches for rabbits to chew are 1" - 2" in diameter. Smaller works well too, but get destroyed quickly. Empty toilet paper roll. As is, or stuff it with a handful of hay. Scrap pieces of lumber work for chewing also. Our rabbits don’t seem to have had any problem with plywood; and some of them have chewed their pieces pretty darn near to oblivion. A used cardboard box makes for great entertainment, and a safe haven, once the bunny chews his way into the dark, safe space. While you're at it, you could hide a tiny sliver of apple tucked into some hay in the box as encouragement for your rabbit. Or, turn the box on its side and leave it open. In return for its daily care, your bunny will learn to accept you as the Big Rabbit in its life. Your pet rabbit needs your care every day. It needs protection. In many circumstances, its only access to food and water are what you bring it. Your kind and gentle presence in its life is very 'bunny-like.' Give it a bit of your time and affection each day. But don't forget that you are the Big Rabbit. Set the rules. Treat your pet courteously and care for it daily. In return you'll get the affection and interest of your long-eared furry friend.